When you first start out, despite the fact that you have more potential buildings ahead of you to build than you do existing buildings, the basic layout should be pretty obvious Thanks at least in part to the fact that the way that the game is designed, key buildings will appear in their designated spot regardless of everything else. 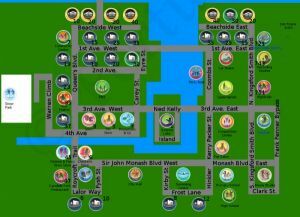 That being the case, and accepting that generally speaking it should be rather easy to give you directions to a building or home, the way is made a lot easier when we can reference locations by address - and so with that in mind we have created a map that lays out the various locations and destinations in the Sims FreePlay Town that was created to facilitate this guide. 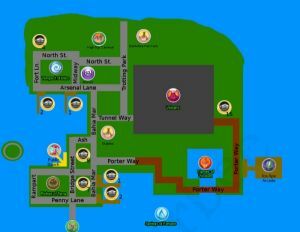 The Official Unofficial Street Map for your Sim Town in FreePlay! Map Copyright © 2014 Femme Perturbee. Custom Contents Copyright © 2014 Web Media Ltd.
Limited Rights Reserved: Attribution; Share Alike; Non-Commercial. Little Whinging Sim Town Map in 800p so you can read the the notations. Little Whinging Mystery Island Map in 800p so you can read the the notations. We have created a basic street map that can easily be used to find any location by address. 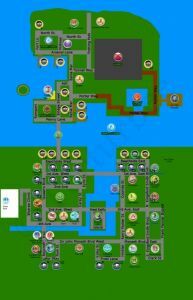 The map is based off of the community map from Perturbee, with additions and modifications to match our guide. The Planning and Zoning Board Lot Use and Restrictions Report included below not only fills you in on the various use restrictions that each lot in the Legal boundaries of the town can be used for, it also gives you a directory of the lots in your town by street address! Note: If you are not aware of this, when viewing the town map while visiting a Neighbor Town, any lots that have Pets (dogs or cats) present on them will be marked by a very small paw-print on the left-hand-side of the Icon, with a number indicating how many pets are present. Directly across from the Pets listing is the humans listing (with a small stick figure symbol) that tells you the number of Sims present. Any address that is listed above in bold-type can be visited when you are visiting a neighbor and will have actions or tasks that you can do while visiting. Courtesy Lot = This lot contains a building or Objects intended for use by visitors who are questing. Empty Lot = This Lot has been purchased but has no building. Empty House = Lot purchased, House Built, but nobody Lives There! No Structure = This Lot has not been purchased or developed. No Vessel = This Slip has not been purchased or developed. As a suggestion what you want to do is print out a list of the street address books and then fill in the family names for the Sims who reside there - they you can easily give directions to your mates should you need to tell them what house has what resource for when they are visiting! For the complete list of the resources on offer in our town, check out our Courtesy Houses Page (in the menu just above the Town Map Page at the top of the Nav Menu). For a complete breakdown of each household and their economic Stats please see our Sim Census. If I fail to complete a quest on time do I just miss out on what I would've aquired or unlocked? I just figured out how to get the telescope but I do not have enough LP to complete it in time. I've missed out on one other quest already too. Thanks everyone! How do you go to the mysterious island in a neighbour's town? I can't meet bree in the community centre as I don't seem to have one ? Click on the dot dot dot … icon at the bottom of the screen, to open several options. You want the Lock icon on the lower left. Click to sign into Gamecenter and msnage friends. I don't like to give out my friends addresses, but if you have no such qualms, also go to your systym Settings, click on the Gamecenter heading, and you can tell it to use your Contacts and Facebook friends to find matches. Without giving that permission, I nevertheless found my brother, niece, and 2 friend's names. So I'm stuck, I'm doing the horses quest on the island it wants me to buy a telescope from the promotions r us store on the town map but I can't find it anywhere? Help would be greatly appreciated. I'm playing on an iPhone if that helps. First, you have to build Promotions R US store (under the Park on the map). See the map above for more details location. Although the last comment here was made some time ago, there is, in fact, cross platform connectivity. I frequently use a hobby house belonging to an iPhone user, while I am on a galaxy S5. The connection must be made through Facebook. I am playing on an Android device. Is there a way to ad "chrisboots" without Gamecenter? I would love to be able to access the courtesy houses as well. When I said the bottom right what I meant to say was the Bottom Left Corner of the Map. I, like most players, prefer to place my courtesy houses (plural, I have two) in the bottom LEFT corner of the map so that they are in a predictable and easy to find location. the sim tracker (above the needs bar) has little icons with the sims. under every sim portrait, unless the sim is completing an action, there is two of four possible buttons - two pertaining to work, two to home. the home buttons are the whistle - shown for inactive sims who are not currently in the house you are viewing, and a little house icon with an arrow in it, the "go home" button. it's possible your daughter is either keeping her sims constantly active, or attempting to do this in the town view, which does not have any buttons. Hi, i don't play games but my daughters been playing Sims on my phone & its told her to use the sim tracker to make the 2 Sims get together and be funny to each other, by pressing the whistle button. But we cant see this whistle button! Where is it? Shes driving me mad! On the page "Adding a Courtesy House" you suggest the bottom right corner of the map. The bottom right corner of the map is where Sim Studio is located so I'm confused as to where the courtesy house is commonly placed. What is the address of your courtesy house.